Woohoo, it's time for our fall storytime session! Although we do baby storytime and Toddler Time every week, we have a short session of fall storytime this year since we've had one staff person on maternity leave. You can read a little bit about how we typically run our storytime sessions here. For this session, I have 4 staff members (including myself) presenting storytimes, so we each have one time slot during the week and we each planned one of the weeks. Of course, each storytime presenter may tweak the storytime plans to fit her group. Memory Box Item: This week's Memory Box item was a lion from Are You a Horse? 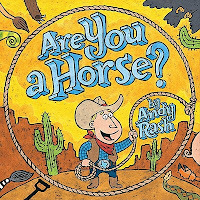 Book: Are You a Horse? by Andy Rash. The kids loved this one! A cowboy gets a saddle for his birthday and he must find a horse so he can go riding. 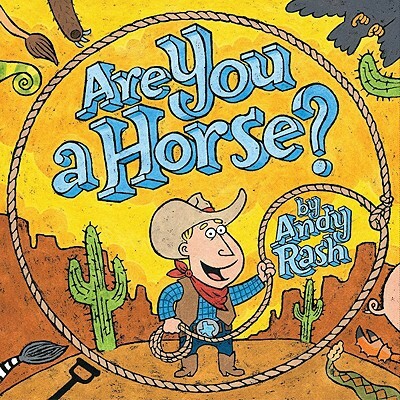 He meets several different objects and animals, asking each one, "Are you a horse?" The kids loved to shout out "NO!" and identify the object or animal. The text might get a little wordy for a storytime readaloud, but it works just as well if you shorten it and everyone cracked up at the surprise ending! I'm not going to put the entire rhyme here because it's kind of long. We have felt horses of different colors and matching manes and tails. I passed out the manes and tails to the kids and when I called their color in the rhyme, they brought up their pieces and put them on the appropriate horse. Noticed something missing one sunny day. Their manes and tails were in children's hands. I'd like you to bring my tail and mane back."... Etc. through all the colors. 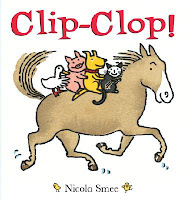 Book: Clip Clop by Nicola Smee. I had a longer book picked out, but they were getting a little squirrelly and I didn't think they would sit through it, so I chose this shorter book instead. Felt Activity: Color horses in the corral. This is similar to the felt activity we had already done. I passed out horses that were made out of different felt colors and as I called the colors, each child brought up their horse and put it "in the corral". When I do this, I always try to set aside a set of one felt item in each color that I place on the board when I say the color. This helps any kids who aren't quite sure of their colors yet. At the end, we counted all the pieces as I took them off the board. Take-Home Craft: Footprint Horse. We had all the pieces pre-cut and included google eyes and pre-cut yarn so all they have to do is glue the pieces together at home. We also include an instruction sheet and a handout with a related book list and early literacy information/activities in each take-home packet. The longer book that I skipped over was We Go in a Circle by Peggy Perry Anderson. It's a quieter book and I tend to prefer funny books for storytime, but I wish I could have shared this with the kids. 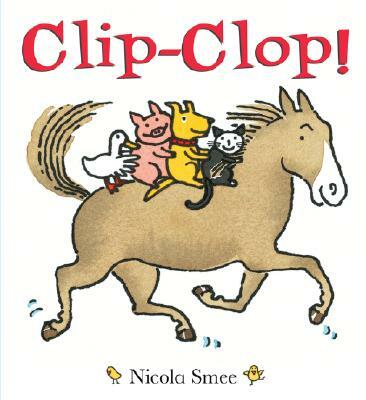 It's about a racehorse who hurts his leg and is taken to a farm where kids with disabilities can ride him. This is a great topic to introduce to young children to incorporate some diversity in your storytime. Great storytime horse books are not incredibly easy to find. I believe one of my staff members is using Oh, Harry! by Maxine Kumin, but I thought it was a little too much for my crowd. You could definitely supplement with farm books that have horses. Any ideas for horse readalouds?